You find our wind-rating calculator below. It can be used to determine a rating but please remember, this is just a guide. Step 6: Now You your areas Wind Rating will be calculated. The above map shows you the approximate wind rating areas in Australia. Starting with Region A, the yellow section, winds are fairly mild and pick up a bit when you move into Region B which is more coastal and you can expect a max of around 147KM/hr at worse. Most of our Australian made sheds are suitable for Regions A and B. Then Region C, orange section on the map, is where you experience high damaging winds of which our sheds are only suitable if you add a cyclone kit. Not all models offer this option but they ensure your shed has extra reinforcements for high winds. Final Region D is the extreme weather zones. Very small but for your safety, we do not recommend our products for these areas. You are best to speak to a cyclone building specialists who can make recommendations. 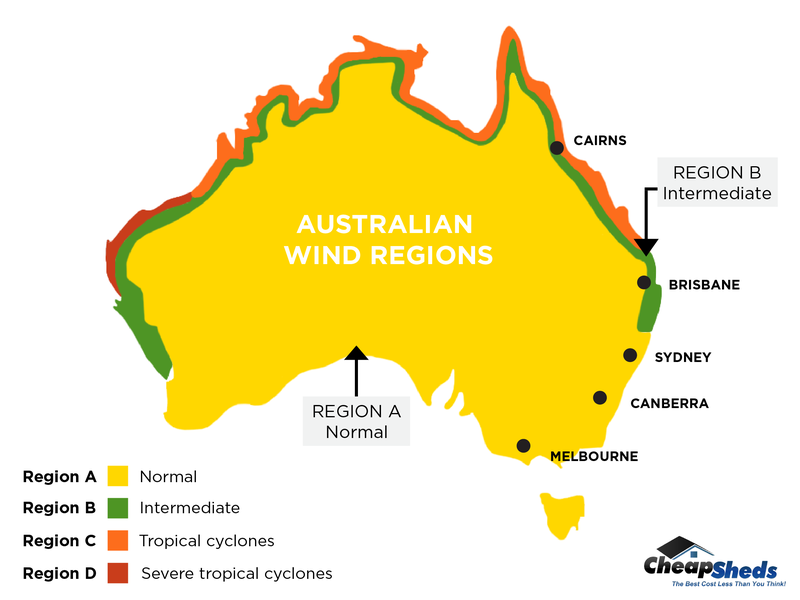 WHY do you need to check your Wind Rating? Before you purchase your shed, garage or carport it’s a good idea to check the wind rating of your product to ensure it's right for where you live. WHY? Well, the last thing you want is to see your shed 500m down the road after a storm. Strong winds and cyclonic weather can easily turn your shed into a missile! So be sure to check the wind rating of your area before purchasing a shed. It’s a rating which is assigned to a certain area based on the geographic region, shielding, topography and terrain conditions. For example, if you live in North Queensland your wind rating will be higher than someone who lives in Orange, NSW. WHY? Because North Queensland is located in what’s classed as a ‘Tropical Zone’. This area experiences cyclones and severe storms throughout the summer. Whereas a place like Orange, which is located roughly 300km west of the NSW Coastline would rarely experience conditions such as North Queensland. Please don’t base your decision on past weather events. It’s recommended you check with your local council as they will provide you with the correct wind rating. And you’ll need to know you wind zone to ensure you get the right product to suit your weather conditions. So decrease the risk to yourself and others by ensuring you have the right ‘wind rated’ shed and if necessary, cyclone kits.